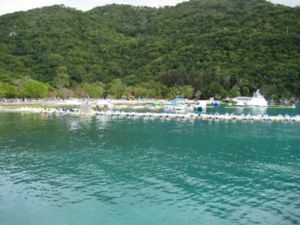 Labadee is a port in Northern Haiti. Dragon Tail Beach, Labadee. Dots in the sky are people riding a zipline. Is a tiny remote fishing village about 30 minutes outside of Cap-Haitian, Haiti's second largest city. Unknown to most, the village boasts several lodging options which provide opportunities to enjoy delicious freshly cooked local seafood, organic fruits and vegetables sourced right from the tree, and delightful taste of local Haitian communal culture. Labadee is also a private resort leased by Royal Caribbean International (RCI) for use by its Royal Caribbean Cruise Line and Celebrity Cruise line cruise ships. Royal Caribbean International has contributed the largest proportion of tourist revenue to Haiti since 1986. The resort is completely tourist-oriented and safe as there is a personal security force. A controlled group of Haitian merchants are given sole rights to sell their merchandise and establish their businesses in the resort. The site is fenced off from the surrounding area. The ships are no loner forced to tender passengers ashore as a passenger pier has been built. As a virtually private resort for the cruiselines owned by RCI, the primary but not only entry for visitors is by cruise ship. The cruise ships moor to the pier at Labadee capable of servicing the Oasis class ships, which was completed in late 2009. Other visitors can come by land to the resort's security gate or may use small water taxis from a nearby town. Guards are reportedly very "firm" with anyone (especially Haitians that do not work there) who attempts to breach the security perimeter. Except for some workers and security people, virtually no one stays beyond twilight. The resort is on a peninsula about 300-400 m long, so is small enough to reach all areas by foot from the landing dock. Open air shuttles also run between all areas. The resort does offer wave-runners and kayaks to explore elsewhere along the sheltered shoreline. The beaches are quite pretty, though the ones closest to the dock can become crowded if the cruise ship is carrying many families. Consider taking a shuttle to one of the areas to the left from where you tender in. A few lifeguards watch the designated swimming areas. Some snorkeling can be enjoyed around rock ledges on the protected side, but the resort insists that snorkelers rent/use bouyancy vests, making diving problematic. Swimming on the Atlantic side can be tricky (due to undertows and sharp rocks/coral) if there is a brisk wind (often). Padded beach chairs are available at no charge. Cruise line activity staff usually organize a volleyball game at the volleyball court. Children (of all ages) may also enjoy a modest waterpark with floating waterslides. Adults can ride the Dragon's Breath zip line, a long (but fast) cable slide starting from high atop a nearby hill and ending in the resort. Riders are first trained on a small line (August 2014 fee: $95). Jetskis and other "water toys" are available for rental. The cruise lines run snorkeling, kayaking and sightseeing excursions. The resort offers a large but sometimes repetitive group of stalls (inside and outside an open-air building) offering Haitian arts, crafts, souvenirs and Haitian rum. Prices are typical for what is found at most cruise ports. Vendors are highly aggressive and will haggle. If you decide to go into the building, be wary of entering stalls that have a dead end as vendors have been known to block the exit by standing in the doorway to attempt to prevent those who have not purchased anything from leaving. One of the top rated things to do in Labadie (Labadee) is the private tour called A Paradise Cove Escape and Haitian Village Experience where you are swept away to one Labadee's best beach for an exclusive cultural experience. Additionally, check out A Luxury Sailing Yacht Experience and board a 62' luxury sailing yacht to explore the north coast of Labadee. Most of the food and beverage offerings (hamburgers, hot dogs, BBQ, salads, fruit, soft drinks, juice drinks) are catered by each cruise ship at three "cafés". Passengers receive a buffet lunch and tea, lemonade, punch for free but must pay for soda and alcoholic beverages just as on the ship. There are seven bars scattered across the peninsula, including a nice bar overlooking the beach near the main café building. Waiters constantly offer frozen drinks along the beaches and will also retrieve well drinks or beer on request--all at cruise ship prices and paid by cruise ship room key/account card. There are no such facilities in the resort, and security guards will remove any visitor trying to remain overnight. Getting out of Labadee is an easy process if you know how. RCC personnel will insist it's not possible however stop at the first Info booth, sign yourself out and voilà, you're on your way. (Don't go all the way to the exit gate, they'll only send you back to sign yourself out). Once out you can opt for a day at Comier Plage just 5 minutes up the road, travel 20 minutes for a day in Cap Haitien, or arrange for someone to take you to Milot to see the Citadelle and/or Sans-Souci Palace. If you're going to the Citadelle, get an early start. It'll be a long day but well worth it. 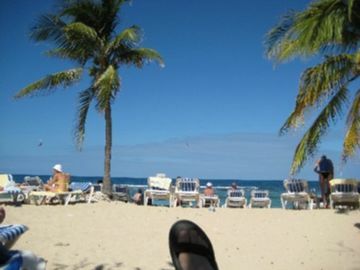 Another option is to tour the local village of Labadee and enjoy the local beach vibe at Belly Beach. This page was last edited on 1 June 2017, at 19:34.